AUGUSTA, G.A. 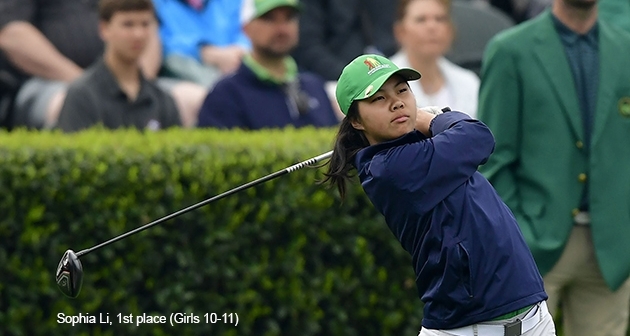 – Four young players from New York State were among the field of 80 players from 27 U.S. states and Canada, who qualified for this year’s Drive, Chip and Putt National Finals at the prestigious Augusta National Golf Club on Sunday, April 7. Sophia Li of Fresh Meadows, sank both her putts to win the Girls’ 10-11 age group in dramatic fashion. She secured the division by a point after the perfect 10 on that stage, and became the only girl to sink both putts in the six years of the Drive, Chip and Putt National Finals event. The other girl representing the Empire State was Forest Hills’ Alexandra Phung, who finished 6th in the age 7-9 division. In the Boys division, Owen Walsh of Goldens Bridge finished in 4th for ages 14-15, after capturing a perfect 10 on the putting stage. East Hampton’s James Bradley finished in 10th in the 12-13 age group. The quartet of youngsters advanced through multiple stages of qualifying to secure their way to the coveted championship in Augusta. The opportunity these players experienced was certainly once in a lifetime for many! Qualifying for the 2020 Drive, Chip and Putt is now open for registration, sign up for a free local qualifier today and begin your road to Augusta!